The Isaacs put a mainstream sounding vocal track against a modern bluegrass instrumental background. A very pretty tune. If the sweet Holy Spirit should ever leave me. 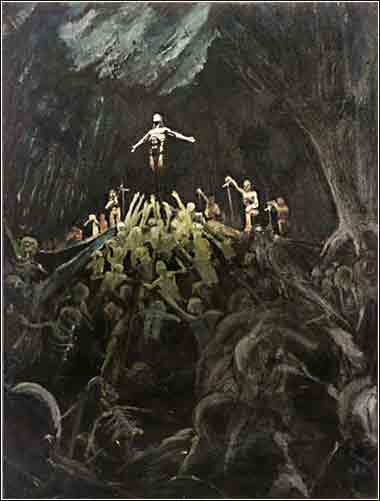 Christ Victorious by Christian St. Pierre (1992). Therefore hear this, you afflicted, drunken with wine. Your Lord Jehovah speaks, your God who pleads the cause of his people. "Behold, I have taken the cup of staggering out of your hand, even the bowl filled by my wrath; you will drink it no more. I will put it instead into the hands of them that afflict you, that have said to your soul, 'Bow down, that we may pass by.' For you have put your back flat on ground, as flat as the street, to them that pass by you." In the 6th Century B.C., the Babylonians (under Nebuchadnezzar and his heirs) sacked Jerusalem, knocking down the walls, the houses and, most importantly, the Temple. Most of the prominent Israelites who survived were taken back to Babylonia in chains, to become slaves. In Isaiah 51, the image of wine and the cup are used extensively: First, as an analogy for the general moral dissipation of the Hebrew people (which surely included excessive drunkenness); and Second, as a concrete metaphor for God's wrath. Drunkenness, which prostrates men with intoxication, and God's wrath, which lays men on their backs in death or fear of the conquering Babylonians, are both represented as drinking from a cup. But Isaiah, the great prophet of the transition from the Old Testament to the coming of Christ, has many layers of meaning, and his message of hope to those "flat on their back" lives on today, in full force. Most of us have paid a price for our sins during our lives. In extreme cases, our lives seem to be permanently damaged. We lose our home or our job, we get divorced, we go to jail. We clog our arteries and wait in patience, trying not to feel the terror of the heart attack or stroke that will come. Our ability to withstand some temptation seems inadequate, and we feel doomed to continue sliding down a slope, for we do not have the strength to stop our fall. Many are terrorized and controlled by other people. This can be especially acute outside the English-speaking world, but it can happen to anyone. And the victims are powerless to fight their oppressors. But there is one who has such power, and that is God Almighty. He has the power and, as one person after another will testify, He will help if asked often enough and with conviction. Because His power is greater than that of sin; His power has overcome death itself. God can and will help us if we ask him with sincere and steadfast hearts. It is true that good Christians are murdered or suffer gravely: we cannot know the mind of God. But person after person will testify to victory over a seemingly insurmountable obstacle, that came only after they began to ask for, and unwaveringly believe in, God's love and willingness to help us overcome our sin.